President Trump's border wall and our government's shutdown still dominate the news. While leftists bash Trump and his agenda, pastor and prophet Frank Amedia says building walls around our nation's borders is completely biblical. And in the same way, open borders are actually unspiritual. Indeed, Franks calls opening the borders a globalization tactic meant to lead to a one-world government. While at first glance, globalization looks compassionate—as it aims to allow other nations to have what we have—it also carries a serious danger. Not only does it lend itself to a powerful elite that controls the common people with money and power, but it also sets the stage for the Antichrist. With all these spiritual factors at play, it's no wonder leftist politicians and media are doing all they can to strip Trump of his authority. Frank says this is just the beginning of the chaos he prophesied for the beginning of 2019, and unfortunately, it's just going to get worse. "It appears now that whatever is coming out of [Robert] Mueller is going to come in February and March," Frank says. "We may well see an impeachment process begin in March or sooner. But God is going to prevail, and what they have intended for bad, God will make good—not because Trump is or is not a Christian. That's between him and God. But it's because this anointing is upon this man to stop and resist and break all of these forces that have been against this nation as one nation under God and against the body of Christ." Today marks the 28th day of the longest government shutdown in U.S. history, revealing the intense gridlock our nation is facing over President Donald Trump's border wall. Several previous presidents have promised to build walls, and even more—including Obama—called illegal immigration a huge issue and promised to deal with it. And yet because Trump is actually trying to make this promise a reality, the left has attacked him and done everything they can to hinder his agenda. But in the midst of this political chaos, Christians must ask, "Where is God in all of this?" Frank was one of the first people I heard prophesy that Trump would become president. Of course, that prophecy came to pass, so I asked him if he had a word for what's going on right now with the border wall. He told me that this situation is more than merely a government gridlock between Trump, Chuck Schumer and Nancy Pelosi. "It's a deadlock," Frank says. "It's a spiritual stronghold that God wants to break, that this man has an assignment to break—albeit whether he knows it or not. But he has the tenacity, the perseverance, the strong will and the stubborn ability to stand against all odds and say, 'I will not bend.'" If America loses its national authority, it could lead us closer to anarchy. And part of maintaining that authority is building a wall, which Frank says is actually much more biblical than many American Christians realize. "Walls are very scripturally based," Frank says. "And we have seen so much banter and talk that have been either from ignorance or actually just deceit about walls. We know Speaker Pelosi said walls are immoral. ... But we find from the beginning of recordation, of testimony of the Word of God, ... walls are dealt with. Walls define borders. Walls define tribes. Walls define the fate of the people within those walls." Frank points to Nehemiah as an example of biblical reasons to build a strong wall. "Throughout the time [Nehemiah was building the wall], he was ridiculed, he was harassed, he was threatened," Frank says. "But that wall was extremely important to God. He gave that assignment. Why? Because defined within those walls was a nation. And a nation is a sovereign entity before God." I agree with Frank and am grateful he is sounding the alarm so Christians can pray. In fact, his ministry, POTUS Shield, offers regular intercessory prayer for our president and nation. You can visit potusshield.org for more information and text "potusshield" to the number 313131 to receive text alerts and prayer updates. If you ever want to unsubscribe, just text "stop" to the same number. To learn more about how God has been using Trump to fulfill His agenda for the U.S., check out my latest book, Trump Aftershock. In it, I offer journalistic evidence of Trump's accomplishments from a Christian perspective. You can buy your own copy at trumpaftershock.com, amazon.com or anywhere books are sold. Listen to my podcast below to hear more of Frank's spiritual insights into serious issues our nation is facing, including immigration reform, DACA and more. 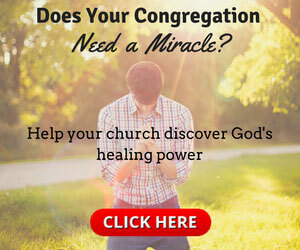 And share this article with a friend to get them praying too!